Update: The KC-MIA game no longer shows up as live, but all unclaimed players remain erroneously on waivers. Thanks Yahoo, you just cost me (and who knows how many others) the chance to make a couple of game-day adjustments that could end up being the difference between a win and a loss. Yeah woke up from a long night and thought I was losing it. AJ Green, Welker, Roddy White, victor Cruz, Reggie Wayne, which three would you start? How many points do you expect Robbie Gould to get me Monday night? ADVICE!!!! So my RB corp is dead / dieing. I have put together a trade that I am seriously considering. I have R. Mathews, A. Bradshaw and J Battle, M Colston, J Nelson, Crabtree, and A Brown, Jets D and Texans D. Thoughts???? The uncertainty and injuries of R Mathews and Bradshaw is killing me. Sounds like a good trade for you. I actually have most of those people on my team. Turner and Sproles can put up pretty consistent numbers and Bush is seeing a lot more action with Thomas being out. yeah, just get nervous letting Colston and the Jets go. Especially Colston he is my best WR. Yeah Jets D is probably tough to let go of, but Texans D isn’t too bad. Antonio Brown is getting a lot more targets since Mike Wallace gets a lot of the def attention. I say all in all, you’re getting a good deal. I would say long term it’s going to be better keeping Tate. If they lock in a playoff spot and rest foster towards then end of the season he’s going to get GUARANTEED points unlike Helu/Torain/Choice going forward. Towards the latter parts of the fantasy year I start handcuffing all of my backs. Right now I have Mcfadden/Bush Mathews/Tolbert Foster/Tate Plus if anyone of them get injured I’ve got an instant fill in for them. Is it good to drop Reggie Wayne in 12 team leagues? Thanks! Smith’s been giving lessons on acceleration to NFL secondaries all year. One more reason to be glad he is on my roster. What about Justin Tuck? He’s on by now, but should I keep he? Will he good when he coming back? Tentatively bullish on Jacoby Jones now that it sounds like Andre will be out for a few weeks. Oakland’s defense has been allowing 273 yards through the air per game, so this should be a good opportunity for him to show whether he’s a capable AJ replacement. I like him as a flex start this week. ESPN Standard league – Flex spot: Darren Sproles, Mike Wallace, or Mike Williams (TB)? 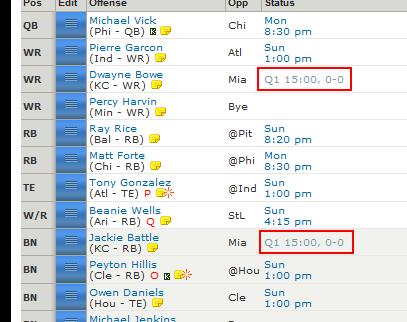 Just for clarity: Starting WR’s Wes Welker and Roddy White. I have Stafford and Newton as my QBs and I’ve been playing Stafford every week.. I’m going to start Newton this week so only address that if I 100% shouldn’t which I’m sure isn’t the case. I just realized they have the same BYE so I’m going to trade one to better my RBs so I was just wondering who you all thought would be a better choice to hold onto as my QB1 until further notice.. So I have these RBs in a standard league: Chris Johnson, Jahvid Best, Cedric Benson, Joseph Addai, Michael Bush, Willis McGahee, Ryan Torain, and Deangelo Williams. I have a guy offering me Fred Jackson for two of those, and I think he’s particularly high on Torain. Which ones would be the best trade for me and which would probably be the fairest trade (so I know how far to go). 12 teams, standard format, no yardage bonus so touchdowns help. Thanks! I have way too many. I’m trying to get rid of them but can’t get any decent trades, and I think they all have too much value to drop to the waivers. They definitely do.. I was stacked at RB in my CBS league and I ended up dropping M.Bush but I can only start 2 RBs max so it may be a different scenario..
Did you work out the trade for Jackson? I’m now offering McGahee, Torain, and Jacoby Ford for Fred Jackson and Mario Manningham – still a good trade for me, right? Is Torain overvalued right now or am I undervaluing him? So after tons of injuries, costing me my first 3 picks, I have managed to piece together what I think is a pretty darn good salvage team. However, I am not sure who to start over who. Knowing that, here are my other options, who would you choose to put in / is there someone you like better of; Mike Tolbert, Mar Colston, Deon Branch, Reggie Wayne, Matt Ryan????? Who’s a better flex start, Maclin or McGahee?